My nieces arrived early on Saturday for our spring break extravaganza, they are both in college and decided it sounded fun to hang out with me and Aaron for a whole week. I have to admit I had been planning our week for the past 4 months and was so excited to finally get started. 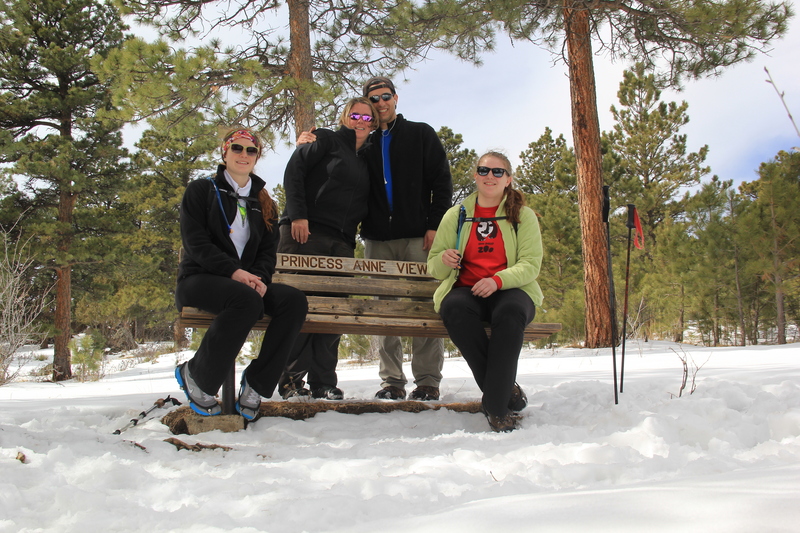 Our first hike was an easy pick and a must do as my niece Anne was going to be here, so we had to do the White Ranch Park Rawhide trail so that we could get pictures at the Princess Anne View bench with her. The details of the hike are here as I did it with their mother when she visited in October. When Aaron and I were out here the week before doing Belcher Hill there was a lot of snow on our trail but the West parking lot didn’t look too bad. Unfortunately we got hit with a snow storm that week between the and their arrival, even though the weather was nice most of the week the snow was still pretty deep and then wet, followed by heavy and wet. 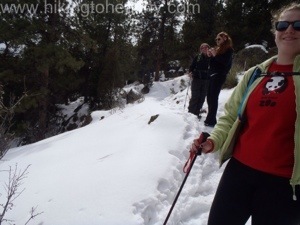 Typically this trail is a cake walk and my nieces were more than up to the challenge of a snow covered walk, as it turns out I was not! We all strapped on yaktrax/crampons shortly into the hike and were moving pretty good, about halfway through I started working on an epic blister on my right heel and by the last mile every step was incredibly painful. I even tried taking my crampons off to see if it would help with the discomfort but no luck. I was so bummed, I kept telling them to go on ahead and I would catch up there was just nothing I could do at that point. I am not sure how it happened, I haven’t taken a break from hiking or exercising, my shoes were not new or old and I was wearing my usual socks so I am chalking it up to heavy,wet, deep snow. In the end it took us a solid 3 hours to finish the hike, mostly because of how slow I was going but also because we took a ton of pictures. As I shuffled up to the car I made Aaron find my flip-flops meant for our hot-tubbing in Breckenridge so I could actually drive to and walk around post hike. 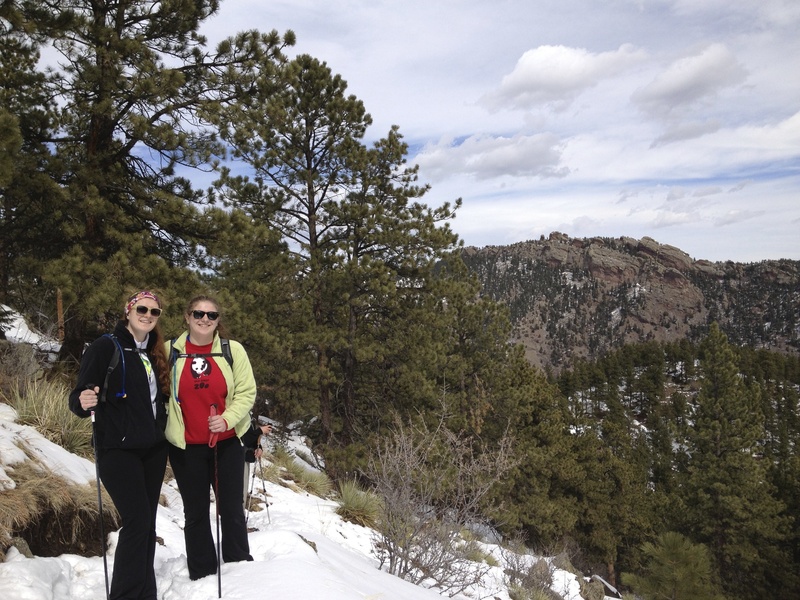 It was so much fun hiking with Lauren and Anne, I was so glad they liked the hike and didn’t mind the snow factor at all. Not even when Anne had to switch out soaked socks for dry ones halfway through only to have those new ones get soaked pretty quickly. My evil genius plan of wooing them to want to live here too is slowly starting to work I think…. Compeed is the solution for blisters. I ran into blister trouble on a 96 mile walk a couple of summers ago and someone gave me a patch of this. Absolutely solved the problem. I’m running low on supplies now and as it’s from either the UK or elsewhere, it’s hard to find. But, a friend found it on Amazon for me and I’m about to stock up. I recommend it 100%. I am totally looking this up and trying it out! I am desperate for a solution as I am a blister queen! 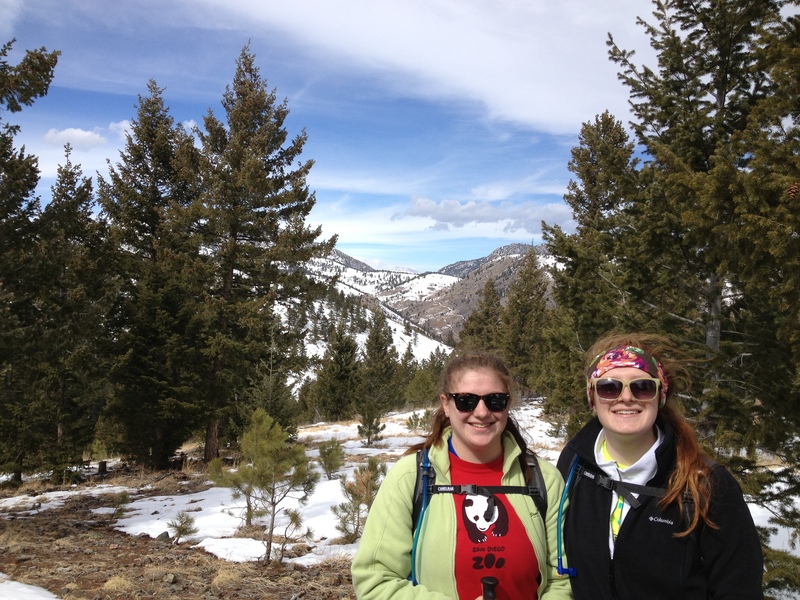 What a nice way to spend time with your nieces, hiking through beautiful country. Sorry your heel was such a bother and I hope you can figure the cause so you won’t have a repeat. 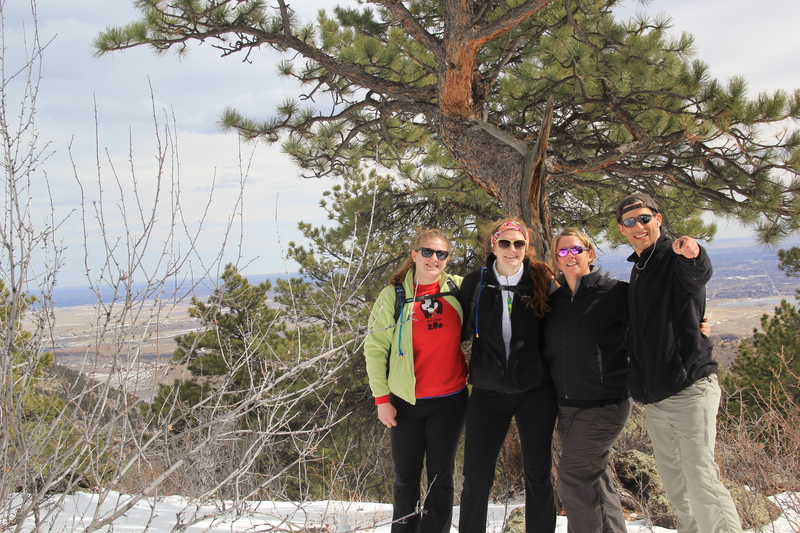 IT was a great way to spend time with them…when they left I asked what they would want to do next time…more hikes! Your walks always look amazing! Thanks Andrew! It is what keeps me at it! It is really lovely on this hike a nice gem of the front range! I’ve been following your blog for a while (thanks to some insider’s information!!) and I am impressed with your dedication to exploration and your focused pursuit of your goals. Hats off to you! 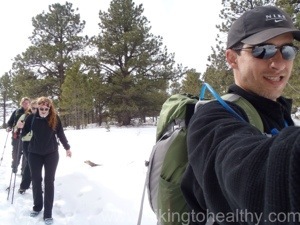 If I may, I’d like to add my perspective on your blister(s) problem: the most common mistake people make when hiking in snow is as follows: they feel they need to compensate for the slower pace by taking bigger steps. This triggers 2 potential problems: first, you might start sliding backwards because your balance and center of gravity are jeopardized by the bigger steps. Secondly, a longer stride puts added pressure on the heel of the back foot and thus contributes to blisters (exacerbated by the fact your shoe will shrink ever so slightly when in contact with wet snow). If you ever contemplate going up 14ers, you might encounter snow, even in the summer, and I would encourage you to develop a kick-step and a shorter step, and eventually perfect the rest-step technique. You’ll find your progress to be faster, easier and your lungs will also thank you for it. Happy trails! Thank you Didier!!! I think your absolutely right, I bet that is exactly what I did. I know I felt off the whole time and couldn’t figure out what I was doing. When the pain was too much I finally started taking smaller steps and it helped me finish. Thank you for the excellent advice…I may have to ask 800 questions on what a good kick step looks like because you know I plan on doing a 14er this summer! It is really beautiful at White ranch park, we are so luck to have it in our back yard! The skies and the views were glorious for your hike. Sorry about your blister, been there, done that. I’ve never talked to anyone who has lived in Colorado that hasn’t absolutely loved it. I’m sure those folks are out there, but I haven’t met them! I totally get what your brother in law is trying to do, I honestly feel like it is the best kept secret in the country. The weather is incredibly mild with often only 1 bad month a year and all the stuff you can do outside year round makes it paradise!